Yes, the wooden spoon in the Junior League Cup. A sterling performance resulting in one draw and four losses. Jason Smith, from Hinckley, is very much on form and he was able was able to defeat Ray on board 4. I didn't like the look of my position against Brian Radesk and offered him a draw which he accepted. Rob struggled against former county champion, Peter Gibbs, and was eventually ground down. For the first time ever, Haka Dave found himself in time trouble. The board was cluttered and although Barry probably had a slight edge in position, it looked as though he could have trouble breaking through. Dave eagerly accepted a draw. The green stripe means that we have been promoted. 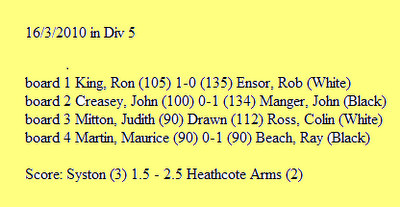 The next significant - and possibly deciding match - in division 5 is Heathcote Arms (2) versus Melton (3) on April 13th. To become Champions, Melton need to beat us, win their remaining matches, and hope that we do not score against the Red Admiral. We, however, do not necessarily need to beat Melton to take the title. We are having a club night next Tuesday, and, if they are up for it, we will try and sort out a friendly with the Red Admiral for the following week. Word has it that the Red Admiral could only manage a draw against Hinckley. This means that they can no longer catch us. Any updates on the Braunstone 4 Vs Melton 3 match would be greatly appreciated. There was an upset to start with as Rob miscalculated and lost on the back row to Ron King. We then equalised as Ray defeated Mo Martin in no nonsense style. Once again John showed us how good he is at endgames. At 2-1 in our favour, my opponent and i each had four pawns and two rooks. My rooks were both on the seventh rank and i had a perperpetual check if i wanted it. I offered the draw to secure the match and this was accepted. Calculators at the ready. Remember it is two points for a win and one point for a draw. Out of 15 league matches, we have played 13. We have 20 points. Last we heard, the Red Admiral had played 11 matches and had 12 points. If we lose our two remaining matches, and they win all their remaining matches, they could catch us. More of a danger, however, are Melton. Before Tuesday, Melton had played 11 matches and had 13 points. Melton played their twelfth match last night against Braunstone. Next Tuesday, we have our last League Cup match, against Hinckley, at our place. We won. If anybody knows how Melton got on at Braunstone, please call me immediately. Full report to follow tonight. HA2 win by skin of teeth at Hinckley. Rob sacrificed the exchange to gain greater mobility and development and this paid off with an early win. I then lost to Jason Smith. Jason had been attacking like crazy and i thought i had been defending well. I only just made the 30 move time control, but then fell foul of some tactics. John was in a bishop versus knight endgame and although it had looked equal, he was able to force his opponent into Zugzwang. This left Ray with a knight and a pawn versus a knight and three pawns - this was looking bad for a while, but then they each lost another pawn, one of Terry's two remaining pawns then fell and Ray's position started to look more drawable. Terry's flag then dropped. Ray, with only his King and Knight left, had insufficient mating material - so only a draw - but it was enough. Afterwards, in the bar, Terry explained to us why he didn't have a computer at home. This was very amusing. Next Tuesday, we play away against Syston 3. Many thanks to Herve for updating the website. There was a lot of content on the site from our Littlethorpe days that was no longer relevant or which had become incorrect over time.The site is now smaller and should be easier to keep up to date. Herve has not been playing this season and has, in fact, moved away from Leicester. He is, however, happy to continue to look after the website. We wish him all the best. We now have a new domain name: http://www.chessinblaby.co.uk/ although you will still be able to get to the site through http://www.littlethorpechess.co.uk/ - at least for now. It may take a while to move the content over to the new domain. Red Admiral 3 and Melton 3 are still hanging on. Last week MM3 drew against Hinckley and RA3 beat Syston. On Wednesday, RA3 and MM3 will play each other (one win each against each other so far this season). I am not sure if the best result for us is if they draw or if Melton wins. We will play Melton once more this season, and our very last match is against the Red Admiral. It looks as though we may have to fight all the way to the finish line. Anyway, we play away against Hinckley this Thursday and a win is very much required.